Discourse regarding this gemstone requires a phone call appointment with the buyer. When you submit this form, please let us know in the MESSAGE area below the best date and time to contact you. Thank you. *unlike the darker areas that show unavoidably in the photos, the 4.56 shows no dark extinction. see the video below for a more accurate tonal representation. We log endless frequent flyer miles and the clock keeps ticking it's futile rhythm. Waiting - it's an exhausting practice especially when it comes to finding the holy grail of corundum; the Padparadscha sapphire of both size and quality. Here's a scenario we've experienced a few times; an after midnight phone call from one of our sources in Asia claims success; "I have a 'pad' for you!" A few days later the parcel arrives and and instead of a victory dance, it's a dour waltz. Looking at each other incredulously, we lament in unison that "it's not a pad." And so, years - even decades - pass and nothing seems to emerge as we wonder when - if ever - will we find and hold the "pad" worth waiting for. Good news - the wait is over. 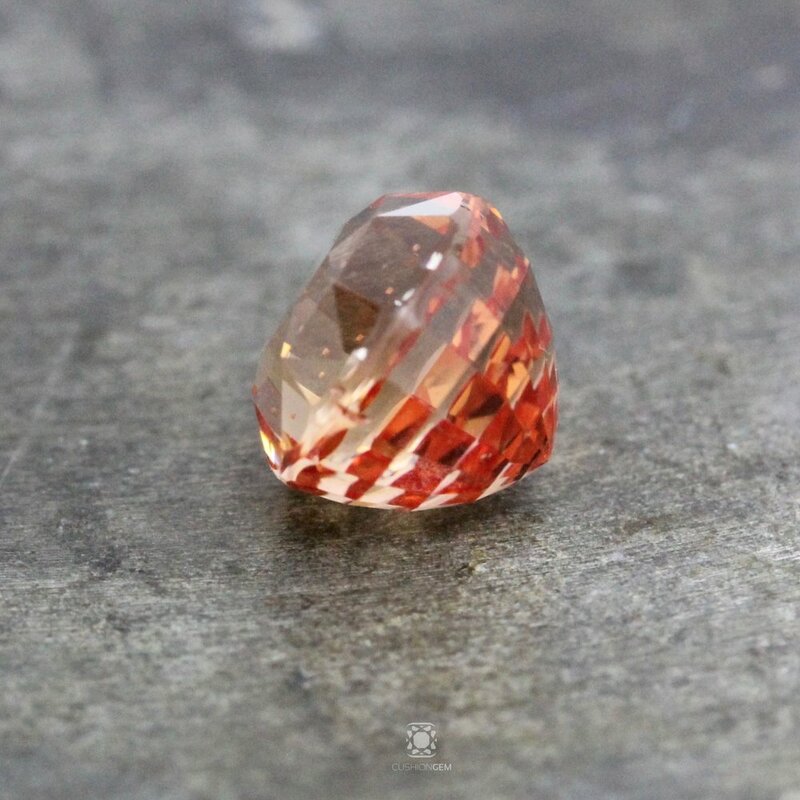 The 4.56 Padparadscha Sapphire you see here is unrivaled in the sum of things it does extraordinarily and in order to approach this with a modicum of understanding, we suggest looking at the gemstone photos and video as well as the AGL certificate to get your bearings on a visual basis. Once you've experienced the gem optically, it's time to head over to our CherrScoring™ graph below to guide us in reviewing this miraculous un-tainted specimen of natural earthly (and heavenly sent) beauty. A Sri Lankan cutter in 1955 photo by Reginald C. Miller courtesy of Reginald C. Miller, Lapidary. CherryScore™ for Cut: 3.6 FINE: Logic would have it that this native cut stone could stand some skilled re-shaping. Logic however is flawed in respect to re-cutting given the delicate nature of color disbursement as it relates to corundums in general but especially to 'pad' types sapphires specifically. Color is a very fleeting thing and often found in pinpoint areas of a gemstone. Re-cutting can sometimes unintentionally alter the color of a 'pad' sapphire. This gem's overall shape is fairly well centered for native cutting (as you can see in the back-side photo next to the dime) and face-up the gems offers no apologies. Kudos to the native cutters who knew exactly how far to take this one. CherryScore™ for Brilliance: 4.5 EXCELLENT +: The 4.56 is a very talkative gemstone indeed and mounting this gem will in no way inhibit it's lively disposition. Displaying a 70-80% brilliant face up appearance is no small thing for gems of this type. CherryScore™ for Clarity: 4.7 EXCEPTIONAL - : Loupe clean. That's not a description we corundum traders associate with gems of this type especially in a similar quality and size. While the gem has some markings on it's faceted exterior surface, the interior is ostensibly (by colored gem standards) loupe clean. Hard to believe at first sighting, however it's true and something we seldom find in the finer qualities in a consequential size like this. Think of the 4.56 as a perfectly clear, clean window to experience the rarest of hues with no interruption or pause. This may be one of only 2 'pads' of size and quality that your examiner has seen over the last 4 decades of such clarity and this may also be the first time since 1999 when the CherryScoring™ system was developed that an EXCEPTIONAL rating was awarded for clarity for this type. CherryScore™ for Color: 4.7 EXCELLENT ++: The title 'padparadscha' hails from a linguistic improvisation that riffs off of the Singhalese word padmaraga (lotus color) hence, our historic reliance on the colorful natural metaphor of a lotus flower. Other metaphors abound such as "tropical sunset" or "tequila sunrise" and the degree of what constitutes a 'pad' is always subject to debate tho what defines the finest of 'pad' colors seldom is. Can nature combine a delicate impression with a vivid color? That's where the finest specimens reside and that existential question is the anchor by which we evaluate 'pad' color born of a narrow blend of orange, pink, yellow and red. Even if you've not been fortunate enough to behold the optimal results of that delicate/vivid natural color marriage, you'll certainly applaud laying eyes on the 4.56. What is the "truth" of the 4.56's color? While it's hard to describe, we like to think of it as a hybrid between the photos taken and the video we provide here; not quite as saturated as the still-photos and not quite as gentle as the videos. Conceptually and optically, that may be a good starting point by which to appreciate the singular delicate/vivid experience this padparadscha provides. CherryScore™ for Tone: 4.6 EXCELLENT +: Though we describe both color and tone separately in our system, the experience of assessing color is inexorably intertwined with the tonal depth of light or dark masking shades. Ideally, we would love to see a "happy" face-up appearance comprised of medium toned influences that shun dark, somber qualities. The 4.56 has what we consider to be just such a previously described ideal tone showing no dark extinction whatsoever. Conclusion: While our CherryScoring™ graph does not rate provenance, the 4.56's origin falls squarely in the realm of the penultimate padparadscha birthplace; Ceylon or Sri Lanka as we know it today. We've seen lovely material from Madagascar and Africa, but the finest in these sizes are typically heated and amongst the un-heated types, few we've seen thus far rival the nuanced blend of delicate and vivid as satisfyingly as material from the beautiful isle of Ceylon like the 4.56. A gem like the 4.56 is an event that occurs very seldom in nature and Cushion Gem is proud to present this price-less rarity for your considerations.